I have two very good friends in New Zealand that I met while backpacking over 20 years ago. Twice in the last few years I’ve made the 8 hour road trip from Christchurch to Wanaka on the South Island of New Zealand to visit them. Back in 1994 when I was backpacking solo in the UK, I was lucky enough to meet up with a couple of Kiwi’s that worked at pubs very close to the pub where I was working in Pimlico, London. Christine’s pub was around one corner and Grant’s around the other. Over 20 years later and I’m still in contact with these great people and their families. They have both visited Melbourne and stayed with me/us on a number of occasions over the years. I have also visited them, once in 2009 with Keira, once in 2012 as a family and the last time in 2014 with Craig for Christine’s wedding. 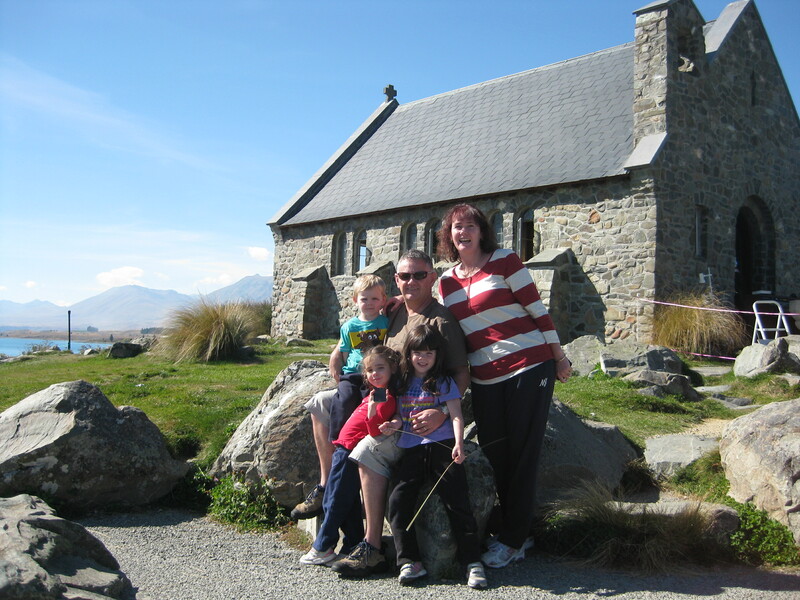 Christine lives in Christchurch with her family and Grant lived in Wanaka but has recently taken his family back to Christchurch. On two occasions I flew into Christchurch and then took a road trip with Christine to visit Grant. Its a long drive with little kids about 8 hours with regular stops but it is also a very beautiful drive and I enjoyed it both times and I would happily do it again! If you fly into Christchurch, spend a few days before hitting the road and have a look around, there’s plenty to do in Christchurch and it’s a lovely city. 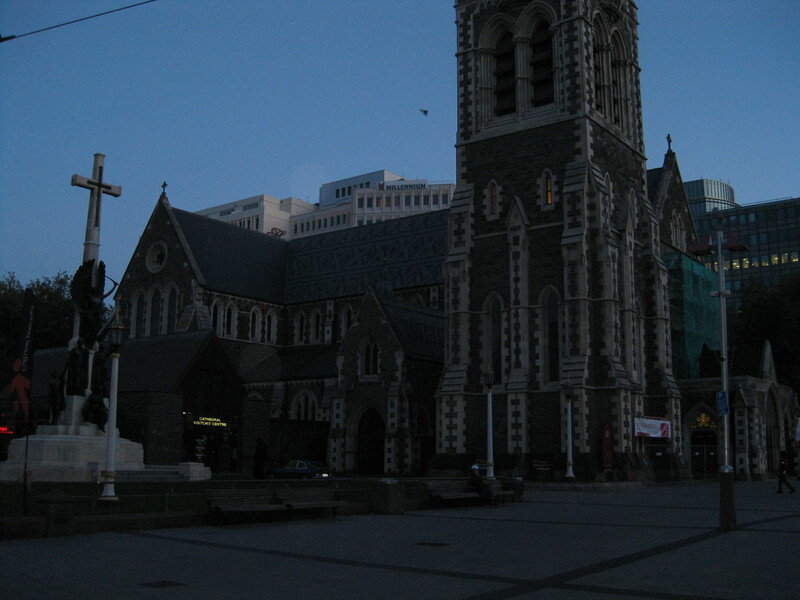 The beautiful Christchurch Cathedral before the earthquakes. We hit the road early and had regular stops for little plays at various playgrounds to ensure the kids didn’t get cabin fever. We arrived at Geraldine, 140kms south of Christchurch with a country village atmosphere and an awesome bakery to boot! Just down from the bakery is a playground that was a real hit with the kids. There’s a few nice shops there selling souvenirs and I bought a fleecy jumper for each of the kids with a kiwi logo on it. They didn’t have the younger kids sizes so I bought them a bit bigger and they still fit now! I love a good buy! The pies were worth a second visit too and I got back there 3 years later for a second crack! After lunch we piled the kids back into the car and headed back out on the road, next stop Lake Tekapo. I was lucky enough to have the front passenger seat so got to enjoy my first sight of the lake in all it glory. It was breathtaking, electric blue and with the white capped mountains surrounding, it was a beautiful contrast. I had never seen water that colour and still haven’t anywhere else. I wanted to run and jump in and have a swim! I was snapping madly away trying to capture what I was seeing, I don’t think the photos did it justice and I can still remember that moment when we rounded a bend and I got my first glimpse, holy cow, I was speechless. Chris, of course, was full of ‘I told ya so’ in her best Aussie accent! I would never have believed it if I hadn’t seen it for myself. Family photo at the Church of the Good Shepherd. We stopped for a bit at the Church of the Good Shepherd. Its a bluestone church built in 1935 and would have to be the most photographed church in the country. You are able to go inside the church and reflect at the altar. 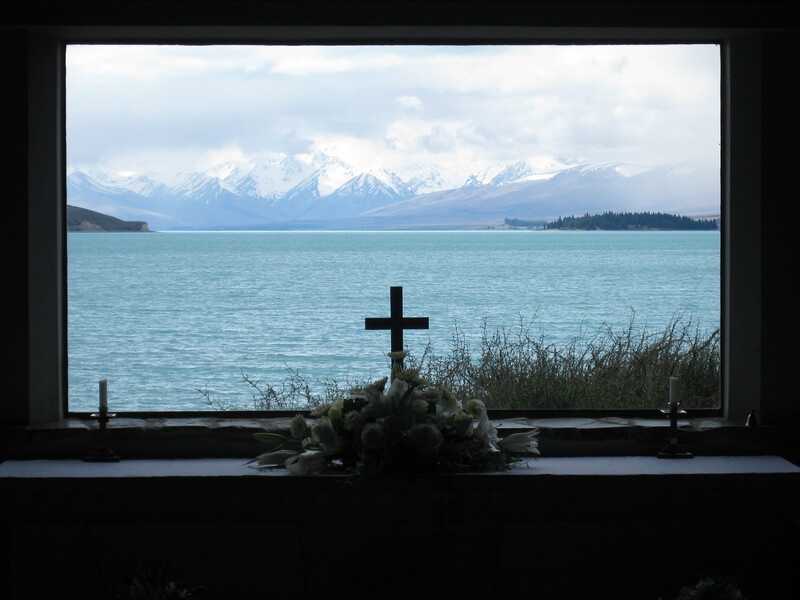 The altar has a large glass window and is perfectly situated at the best vantage point to take in the view of the lake and Mt Cook, the highest mountain in New Zealand, across the other side of the lake. Enough said, you can see from the photo just how truly amazing it is. View from the altar of the Church of the Good Shepherd. So after a few photos and a stretch of the legs we were back on the road again and heading for Lake Pukaki. 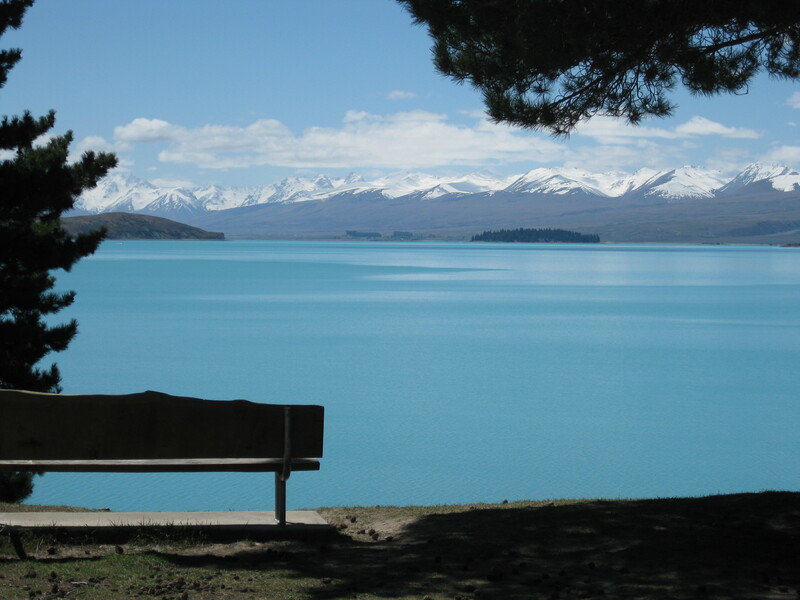 The water here is the same colour as Lake Tekapo and is equally as breathtaking, even after Lake Tekapo the sight was just as overwhelming! We had a quick pit stop and the kids did some rock skimming with the boys – Australia v’s New Zealand of course! There’s a Peppers Hotel located at Lake Pukaki and I would love to go back some day and stay for a few days. It would be nice and relaxing to get up to those amazing views and take a relaxed walk by the lake and settle in and read a book while taking in the views from the hotel balcony. Equally as beautiful Lake Pukeki! The road trip continues, only a few hours to go now and making great progress. Next pit stop for a leg stretch is Twizel. Really pretty town with a great playground for the kids located behind the shopping mall. The bakery has nice sweet pastries for a afternoon snack which the kids loved. You can still see plenty of snow capped mountains around Twizel but honestly there’s not much there other than the playground for the kids to expel a bit of couped up energy. Although apparently popular with astronomers due to it having the cleanest, darkest skies. On we go to Omarama and through Lindis Pass. I get a bit dodgy here as I am prone to a bit of car sickness particularly if I have to turn around in the car. The good thing is once you get through here you know you’re on the home stretch and Grant will have a cold beer waiting for us at the end! The good thing about road trips in New Zealand is that there is generally always something really pretty to look at. There’s something special about mountain scenery, its particularly pretty and I could sit for days looking out the window and taking it all in! 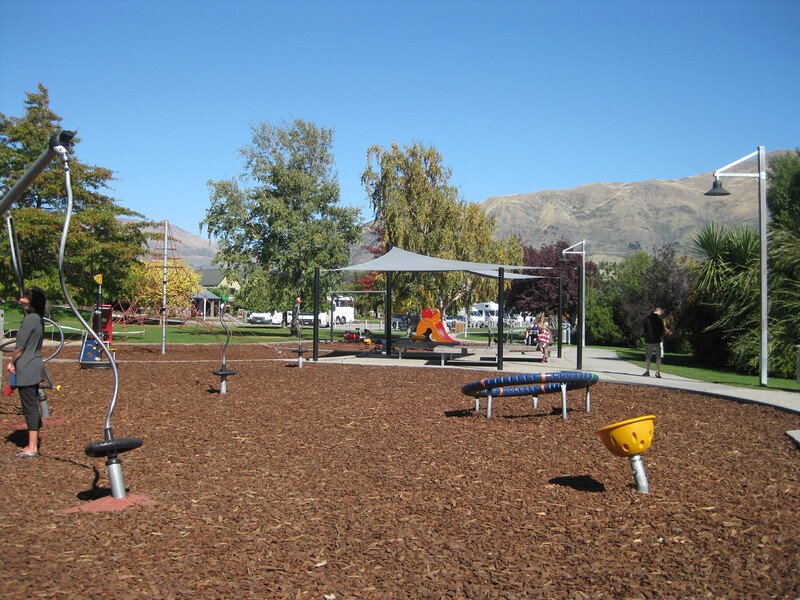 Wanaka is a pretty town located on southern end of Lake Wanaka and is very popular in winter due to its proximity to the ski fields including Treble Cone, Cardrona Alpine resort and Snow Park. Wanaka is also popular in the summer months for outdoor activities including bushwalking, water-skiing, paragliding and kayaking among others sports. Lake Wanaka surrounded by snow capped mountains. Wanaka is less commercialised than nearby Queenstown and for this reason has recently seen solid growth in population. Grant was the Manager of the very pretty Wanaka Golf Course and was well known by locals. Craig had a hit at his course and I think it was his highlight of our trip. Great park located next to Lake Wanaka. We took the kids to a place called Puzzling World located on the road into Wanaka and the kids were kept busy for half a day trying to get through the maze located at the rear. It was a good challenge for the kids who at the time were 7, 5 & 3 years old. In fact it was a bit of a challenge for me! It includes an optical illusion room, hall of following faces and of course the Leaning Tower of Wanaka at the entrance. The kids enjoyed it and it made them think outside the square a bit. 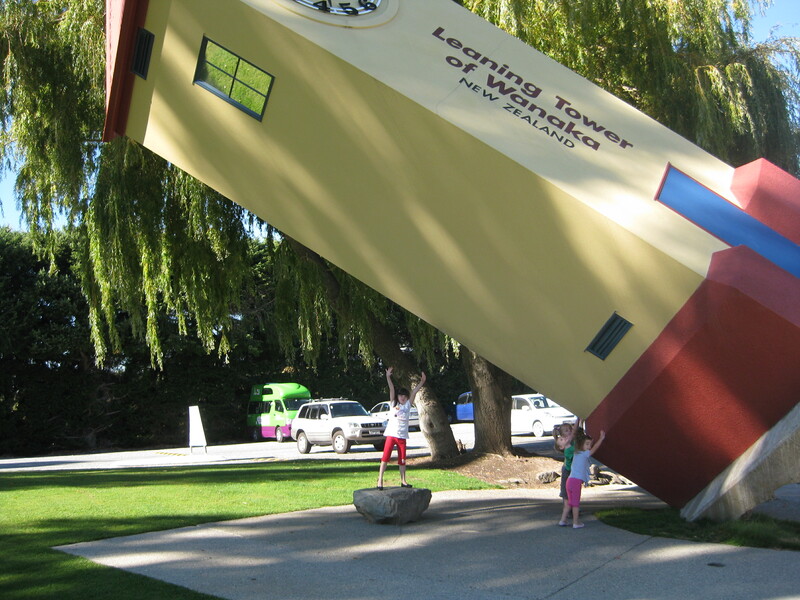 Puzzling World at Wanaka, kids loved it. Wanaka’s a pretty town, shopping is expensive as it is in most places that are resort towns, I would love to return one day but I say that about everywhere! Not sure when we will be heading back to New Zealand but I know one day we will. I’m lucky to have such great friends to visit. I keep telling them it’s their turn to visit now and they know they are always welcome. We also had a road trip from Wanaka to Queenstown, I was informed on arrival that you can’t be this close to Queenstown and not visit for some extreme sport! Craig and I took Alannah on the Shotover Jet, that’s about as extreme as I will go! Then we headed off to Milford Sound for the night, you’ll have to read that post as it was quite the experience. I am yet to visit the North Island, although I found this excellent North Island itinerary which I highly recommend. Thanks Stacee, I realised yesterday that I have been to New Zealand 3 times and I hadn’t mentioned it on the blog, it was our first overseas trip with the kids! I have a couple more to cover off for NZ over the next couple of weeks. Makes me want to go back though! Such a beautiful place. We are off on a road trip tomorrow to pick up our new camper trailer, really looking forward to getting out in it. I haven’t been to New Zealand in over 20 years, which seems ridiculous given how close it is to Melbourne! I think I may have to plan a trip there soon. I know, I’m not sure why we don’t visit there more often either. Such a pretty place and the Aussie dollar does alright against the NZD! Looking forward to more of your stories! Take care! Yes it is a lovely place and I was lucky enough to visit twice. Its a shame my friend has moved back to Christchurch now! Craig loves golf and was chuffed to have a round on the lovely course there at Wanaka. My friend use to manage the course so he even had a friend to hit with! Its a picturesque course as well but he said it doesn’t match up to the Royal Melbourne! Think that’s our Aussie Kiwi rivalry in play there though!